One Hundred Percent American (for the time being) – Patrick F. Clarkin, Ph.D.
Below is a classic 1937 essay by the cultural anthropologist Ralph Linton. I think it is as relevant today – as divisions seem to be growing – as it was when it was first written. Linton was reminding us of some of the ways that our world is interconnected, and that it has been that way for a very, very long time. Eric Wolf summarized things this way: “the world of humankind constitutes a manifold, a totality of interconnected processes, and inquiries that disassemble this totality into bits and then fail to reassemble it falsify reality (1982:3).” (Note: Jason Antrosio wrote an excellent post on Wolf’s take on this interconnected world, and how seats of power have shifted over the centuries. What we see now is merely a snapshot in time). Despite all of the different places of origin of our inventions, foods, traditions, languages, genes, and people, they don’t remain fixed or separate indefinitely. Some come and go, or are adopted in new places, forming new combinations and identities. “All things flow,” said Alfred North Whitehead. On awakening he glances at the clock, a medieval European invention, uses one potent Latin word in abbreviated form, rises in haste, and goes to the bathroom. Here, if he stops to think about it, he must feel himself in the presence of a great American institution; he will have heard stories of both the quality and frequency of foreign plumbing and will know that in no other country does the average man perform his ablutions in the midst of such splendor. But the insidious foreign influence pursues him even here. Glass was invented by the ancient Egyptians, the use of glazed tiles for floors and walls in the Near East, porcelain in China, and the art of enameling on metal by Mediterranean artisans of the Bronze Age. Even his bathtub and toilet are but slightly modified copies of Roman originals. The only purely American contribution to tile ensemble is the steam radiator, against which our patriot very briefly and unintentionally places his posterior. Here a whole new series of foreign things confronts him. His food and drink are placed before him in pottery vessels, the proper name of which — china — is sufficient evidence of their origin. His fork is a medieval Italian invention and his spoon a copy of a Roman original. He will usually begin the meal with coffee, an Abyssinian plant first discovered by the Arabs. The American is quite likely to need it to dispel the morning-after effects of overindulgence in fermented drinks, invented in the Near East; or distilled ones, invented by the alchemists of medieval Europe. Whereas the Arabs took their coffee straight, he will probably sweeten it with sugar, discovered in India; and dilute it with cream, both the domestication of cattle and the technique of milking having originated in Asia Minor. If our patriot is old-fashioned enough to adhere to the so-called American breakfast, his coffee will be accompanied by an orange, domesticated in the Mediterranean region, a cantaloupe domesticated in Persia, or grapes domesticated in Asia Minor. He will follow this with a bowl of cereal made from grain domesticated in the Near East and prepared by methods also invented there. From this he will go on to waffles, a Scandinavian invention with plenty of butter, originally a Near Eastern cosmetic. As a side dish he may have the egg of a bird domesticated in Southeastern Asia or strips of the flesh of an animal domesticated in the same region, which has been salted and smoked by a process invented in Northern Europe. Breakfast over, he places upon his head a molded piece of felt, invented by the nomads of Eastern Asia, and, if it looks like rain, puts on outer shoes of rubber, discovered by the ancient Mexicans, and takes an umbrella, invented in India. He then sprints for his train–the train, not sprinting, being in English invention. At the station he pauses for a moment to buy a newspaper, paying for it with coins invented in ancient Lydia. Once on board he settles back to inhale the fumes of a cigarette invented in Mexico, or a cigar invented in Brazil. Meanwhile, he reads the news of the day, imprinted in characters invented by the ancient Semites by a process invented in Germany upon a material invented in China. As he scans the latest editorial pointing out the dire results to our institutions of accepting foreign ideas, he will not fail to thank a Hebrew God in an Indo-European language that he is a one hundred percent (decimal system invented by the Greeks) American (from Americus Vespucci, Italian geographer). If you’ve read this far, I think it’s helpful to remember that: “Change is the law of life. And those who look only to the past or the present are certain to miss the future.” Along the way, some of the changes we encounter will be easier to accept than others. Some may be exciting, repulsive, or even go unnoticed. But some change is inevitable. Perhaps the goal is to try to steer change in a way than minimizes suffering. For the United States, change has been embedded into its story (or stories) since its inception. New arrivals have found their own niche in influencing, and in turn have been influenced by, the overall narrative. Most common ethnicity in each U.S. county, 2000. Source. And with each rewrite new stories emerge, slightly different than generations before. Sometimes, those stories are unpleasant and full of rejection and conflict. Differences will always exist. We will never agree with anyone all the time… not even ourselves, eventually. But it’s also true that people often overcome barriers of ideology, age, language, traditions, or physical appearance, recognizing the similarities we share with others, that we are more alike than we are unalike. The biologist Matt Ridley once wrote that “similarity is the shadow of difference.” Both exist simultaneously, but the one that resides at the forefront of our consciousness is a matter of focus and emphasis. At the personal level, we can empathize with other individuals by focusing on the similarities (it doesn’t take much effort). But when groups view other groups in some abstract sense, as a barrier, a monolithic enemy, or a means to an end, then empathy evaporates. That doesn’t seem to take much effort either, tragically. Still, the differences are not always as vast as they sometimes appear. 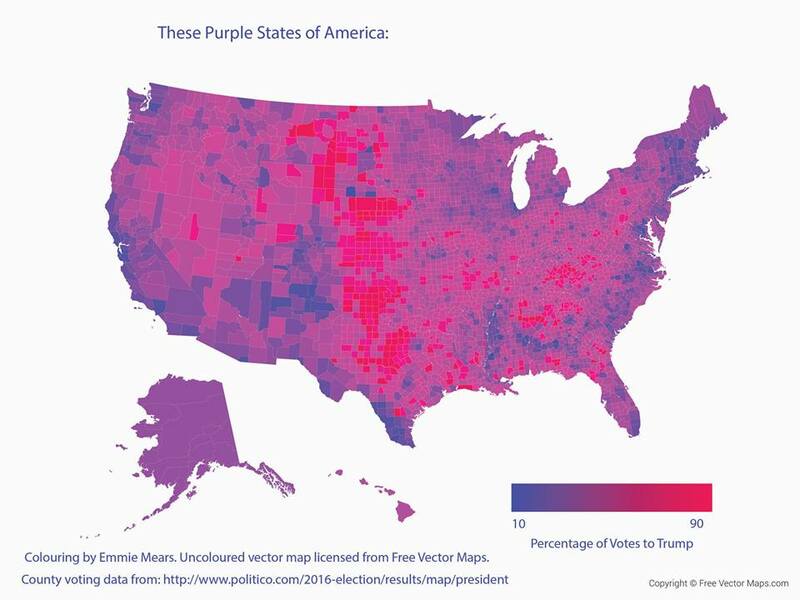 The purple states of America: county-by-county voting in the 2016 Presidential election. Source. This entry was posted in anthropology and tagged Eric Wolf, Jason Antrosio, Ralph Linton. Bookmark the permalink. … it’s good to remember that “American,” like any other identity (like “self”) is not only in constant flux, it’s also as delightfully mongrel as all the rest.